In this topic you will learn how to view video activity in the Audience module. When using Audience Tracking or SSO integrations, the Audience module allows you to select a video and then view activity for that video. This allows you to see who viewed a particular video. All video views in Audience-enabled players will be tracked. To view the video activity, click Video (non-MAP) in the left navigation. 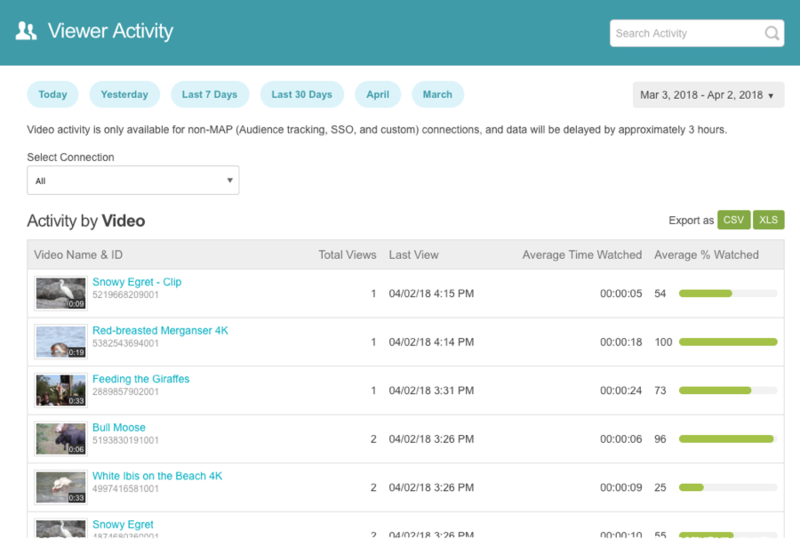 The Viewing Activity page will display a list of all viewed videos from SSO and Audience tracking integrations for the selected time period. The Select Connection control can be used to select a specific connection. The calendar control can be used to select a new date range. Data can be sorted by clicking on the column headers. Note: There will be a few hour delay before the viewing data will appear. Clicking the link for a video will display all the viewing activity for that video. Data can be sorted by clicking on the column headers. The data can be exported by clicking the CSV or XLS buttons at the top of the page. Recent Activity - Used to view video view event data for the past 24 hours. For information, see Viewing Player Events in the Audience Module. Viewer Profiles - Used to view video activity by viewer. For information, see Viewing Viewer Profile Information. Export Data - Used to export video view and lead data. For information, see Exporting Data from the Audience Module. Audience API - The Audience API can be used to programmatically retrieve video view and lead data. For information, see Overview: Audience API.